As it stands, there are 13 days exactly until my birthday (March 12th), upon which I will be turning 23 - eek, how exciting! I have nothing planned this year except a day trip to London with my mama the day before, and possibly a meal out with J and his family. 1) I've been completely lusting after all things LV at the moment, I have no idea why, but I've got my heart set on purchasing a LV Speedy 30 in Monogram print. It's a bag with a price tag, £545 as is stands, which, when thought about, is actually rather a good price for a high end designer bag even though that's approximately what I earn every fortnight. I've watched many reviews on YouTube and have fallen in love - I'm such a bag lady, ha! 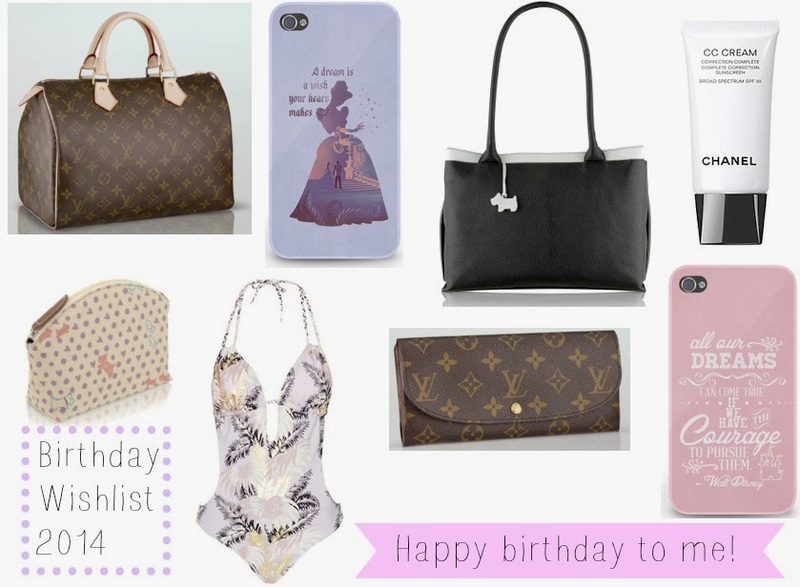 I also fell in love with the little LV wallet you see above, it's named the 'Louise Wallet' which is so fitting...nothing is ever named Louise! That's £375 though which does make me want to cry, and is not something I'll fork out for, but I'll lust after it anyway! 3) Radley is a brand I've loved since I was about 14. My dad once offered to buy me an iPhone back when they were first released all those moons ago but I declined and cheekily mentioned that I'd like a Radley handbag instead...and that is what I got! This handbag is the Templeton Tote in black and it looks like such a lovely work bag and that it can fit an iPad and the rest of life inside it. If (all fingers crossed and multiple prayers spoken) I get the job tomorrow that I've applied for I'll definitely be buying this for work. I also couldn't help but lust after the Hibbert wash bag (below left) in yellow either, so cute! Seen anything that takes your fancy?